Oh, OK. So we know this sign was fulfilled in the depth, with the birth of Jesus in Bethlehem. Yes, Jesus came to the very depths of sin: Planet Earth! And thus was this sign fulfilled in the depths. But God also spoke of a sign in the “height above”. So where is the fulfillment of this sign, in the “height above”? How can there possibly be a woman with child in the height above? You see, God has placed in the heavens, the symbol of His bride, the Church-Faithful. In the summer night-sky, she appears as the woman-in-travail. 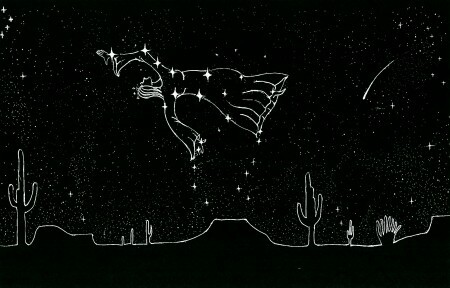 This is the constellation, Ursa Major. 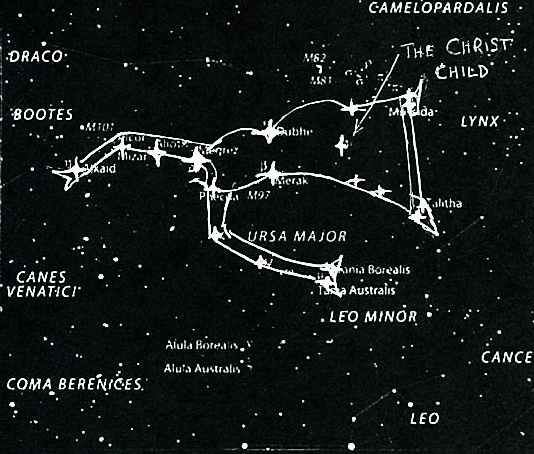 This page concerns the constellation which is commonly known as “The Big Dipper” and the “Great Bear”. It actually appears in the summer months as a woman travailing in child-birth. God has purposely given her no head. But God did this to present a very important concept. Yes, this woman represents the Church, the, “Jerusalem above, which is free, and is the mother of us all” (see Galatians 4:26). You see, the single star she is giving birth to, typifies the Christ child. Reading in Ephesians that Christ is the “head” of the Church, this single star is logically going to become her head. 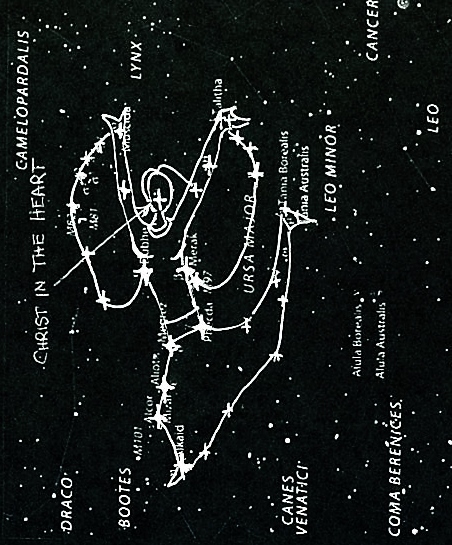 Yes, this Woman in Travail Constellation is a double sign, being seen in two entirely different ways! This is because as the summer passes, this constellation begins to slowly flip around, until the stars representing her arms now become her legs. And the stars that once represented her legs now become her arms. And finally, it appears as the Fleeing Woman of Revelation 12. And at that point, this single little star in her womb-area, representing the Christ-child, now becomes her head! And of course, this reminds us of the passage… “And He (Christ) is the head of the body, the Church…” Colossians 1:18. MARY GIVING BIRTH TO JESUS: A PICTURE OF US! And so, it now becomes more apparent why God has placed this headless woman-with-child in the heavens. She is to present that glorious concept: that God’s people are to strive with God, as God has planted the Gospel seed within His people. And in our victory, Christ will be fully formed within the hearts of each Believer. And at that time, we will shine as the Sun to a world still held captive in sin and darkness. Just listen to Scripture… “My little children, of whom I travail in birth again until Christ be formed in you,” Galatians 4:19. OK, so now this verse from Galatians is a big help in understanding this spiritual concept about men (and women too!) giving birth…to Christ. This is all about overcoming the world. So as with all the Bible, the story of Mary giving birth to the Christ-child has a spiritual message. And, like all the Bible, this story, too, is prophetic. It foretells of the time when the Church, i.e., God’s Elect, will finally throw off her love of this world, and give birth, so to speak, to Jesus Christ. And at that time, Jesus Christ will shine out brightly through His Chosen People in such a way, that the world will fall to its knees, and confess that of a truth, Christ is real, and lives through His people. Then will Christ literally return on that last day! Yes, this woman represents the Church, the “Jerusalem above, which is free, and is the mother of us all” (see Galatians 4:26). You see, the single star she is giving birth to typifies the Christ child. Reading in Ephesians that Christ is the “head” of the Church, this single star is logically going to become her head. But how will that be accomplished? Now, if this Woman-in-Travail were all that the Lord created in the heavens, it would be nothing short of amazing! But God, in His infinite power and majesty, has made this a great sign in Heaven, just as Revelation 12 proclaims. Because as the summer passes, this constellation begins to slowly flip around, until the stars representing her arms now become her legs. And the stars that once represented her legs now become her arms. And finally, it appears as the Fleeing Woman of Revelation 12. And at that point, this single little star in her womb-area, representing the Christ-child, now becomes her head! And of course, this reminds us of the passage… “And He (Christ) is the head of the body, the Church…” Colossians 1:18.